This June we started using 100% local, organic milk! Now, not only do we have certified organic whole milk, but also our skim, 2%, and half&half are organic as well thanks to our neighbors at Working Cows Dairy. For us this is cause to celebrate! Working Cows Dairy, like Amavida Coffee, is a family with a strong community focus. In our local community and abroad, we consider everyone a good neighbor who work for a healthier, more natural lifestyle. The local dairy farm is family owned and operated, and transitioned into an organic farm 10 years ago. Mom, Dad and their three boys keep the cows working and happy. What makes the organic milk is the slow heating pasteurization. The slow and longer heat process keeps the necessary bacterium alive that is good for your body. The De Jong family spent three years converting their farm to produce GMO free milk. Organic milk starts with taking extra steps to make sure their cows are certified and well taken care of. Grass fed and given organic “medicine” when necessary is just a couple of extra steps the De Jongs take for their beloved cows. Whether you drink a latte or just want a little cream in your coffee, you can smile knowing your dairy is being sourced from a sustainable, local farm. And you will certainly taste the difference! Happy cows, happy you! Because we are a company that cares about our neighbors, we have worked hard to find partners with the same values we share. Over time, Amavida Coffee and Working Cows Dairy coordinated to secure a route with other businesses to make it possible to get the weekly organic milk delivery. Networking with other locals and communicating the importance of supporting small businesses is just another way we can keep up the organic nature of our “neighborhood”. Everyone benefits in harmony! From ethical treatment of coffee farmers all over the world, to making an impact on local economy and helping the environment right here at home, we are striving to build a supply chain that links our neighborhoods and the idea of being a good neighbor with everyone and everything that goes into making that perfect espresso or cup of coffee. 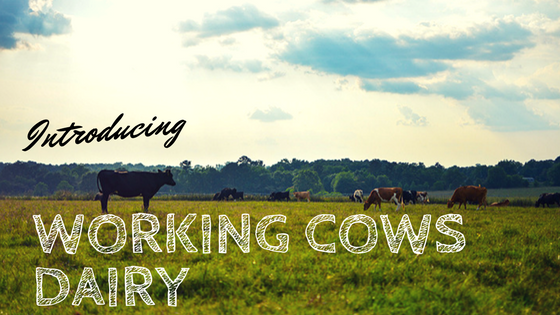 With that said, we are joyous to welcome Working Cows Dairy into our community! Written in collaboration with William Sears, edited by Bianca Austin.